How can ‘Live Guide’ in ‘Nero KnowHow PLUS’ help me? From Nero 2019, ‘Live Guide’ is available via ‘Nero KnowHow PLUS’ in all Suite and standalone end user products. With new ‘Live Guide’, ‘Nero KnowHow PLUS’ integrates a unique and very comfortable feature for getting context sensitive tips & tricks and help from within Nero applications. The new mode called ‘Live Guide’ directly links to related FAQs, manuals pages, and tutorials within the main Suite applications in regards to the actual use case, the application mode, or task performed inside of the application. 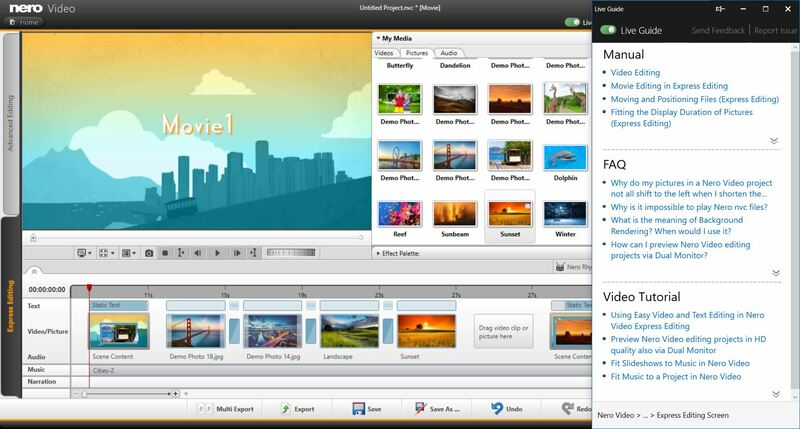 Imagine you have just started using one the of the great new ‘Nero LifeThemes Pro’ in ‘Nero Video’ for creating a slideshow or movie with automated intro and outro, effects, captions, and music. Switch on the ‘Live Guide’ toggle on the header bar of ‘Nero Video’ and ‘Live Guide’ will give you context sensitive FAQs and other information. 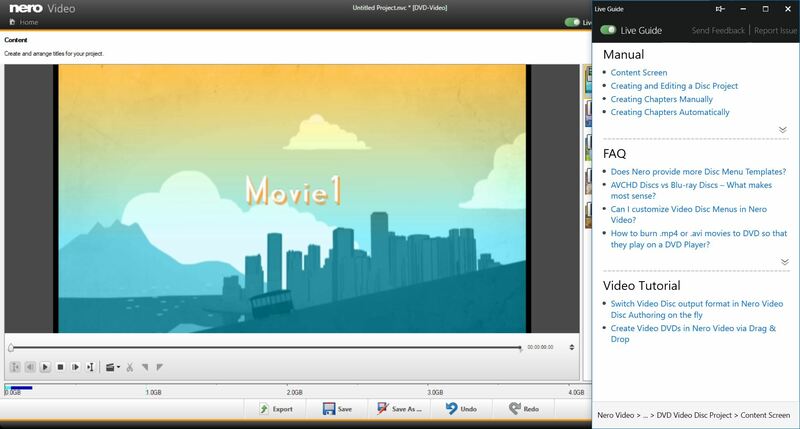 A context path at the bottom of ‘Live Guide’ shows you where you are in your project: ‘Nero Video >…> Express Editing’. In this case you will see all relevant information for editing in Express Mode. Now, when you change to open the MovieTheme template selection window, ‘Live Guide’ will automatically adapt its context to match your new task. Now, the job path at the bottom tells you: ‘Nero Video > … > Movie Theme Dialogue’. The context inside of ‘Live Guide’ has changed, accordingly. 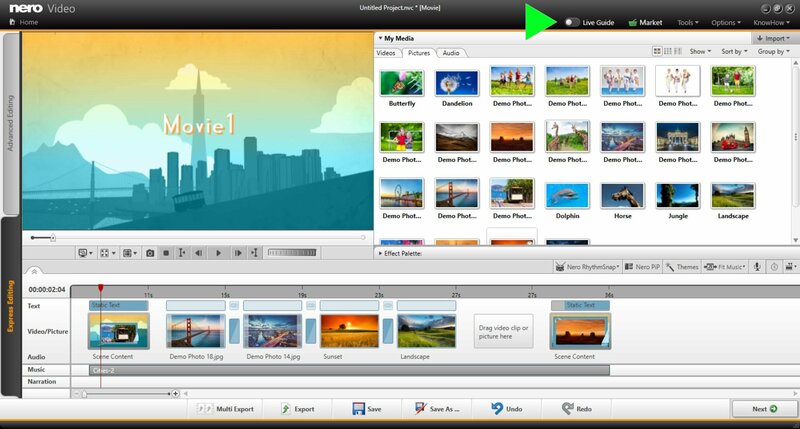 Then, when you handover your editing project to the disc authoring in ‘Nero Video’ for creating a DVD-Video, ‘Live Guide’ will update the context relevance automatically and provide all materials for the new case as you can see in below screen shot. The context path shown at the bottom for this case is: ‘Nero Video > … > DVD-Video Disc Project > Content Screen’. Again, the context inside of ‘Live Guide’ has changed, accordingly. This way, utilizing Nero Suite becomes even more easy and intuitive. Moreover, you can also send feedback and report issues via the respective button in ‘Live Guide’. As mentioned, this context sensitive behavior is available in Nero MediaHome, Nero DuplicateManager Photo, Nero Video, Nero Recode, Nero Express, Nero Burning ROM, and Nero BackItUp. This will give you a very comfortable time using Nero applications and growing with your projects.